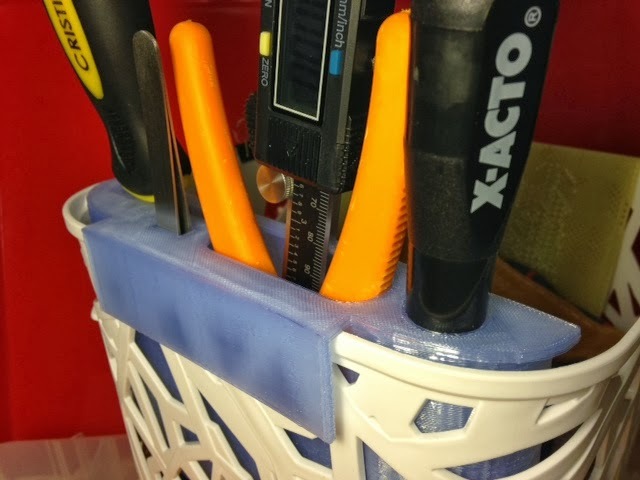 The Afinia H-Series 3D printer comes with a very nice set of tools, some of which are very sharp and difficult to store safely. Today we used Tinkercad to design a tool holder that hangs inside the box that holds our gloves, tape, and other printing accessories. Settings: MakerWare "low" is sufficient but pretty rough for this model. On that setting the print takes 2 hours and 47 minutes. No raft is needed. Technical notes: In MakerBot's translucent filament the roughness doesn't show much, but with something opaque like their yellow filament the low-resolution defects for this model are more obvious. I had some trouble with the first part of this print not sticking to the build plate, so I added a very small, short "distraction cylinder" just off to the southwest corner of the model before slicing. This shifted the non-sticking problem to the cylinder and away from the model itself.